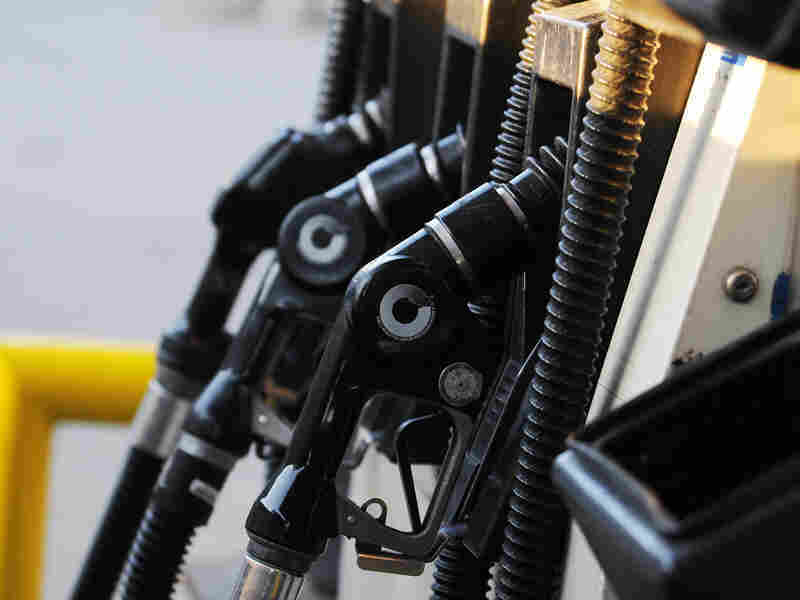 Gasoline Pushed Consumer Prices Up Sharply In February : The Two-Way Prices rose overall by 0.7 percent. The major factor: a 9.1 percent surge in gasoline. Since February, though, gas prices have retreated. So economists do not think the latest report changes the inflation picture. Handles on a gas pump in Brooklyn. Consumer prices jumped 0.7 percent in February from January, the Bureau of Labor Statistics reports. The increase was fueled by a 9.1 percent surge in gasoline prices. Gas prices alone accounted for about two-thirds of the overall rise, MarketWatch says. The 0.7 percent increase was the largest for any one month since June 2009. Economists think, though, that the upward pressure on inflation eased this month. As Bloomberg News writes, there has been a "retreat in fuel expenses this month." Reuters says the news doesn't change the overall picture: "Details of the report on Friday showed no sign of a pickup in inflation to trouble the Federal Reserve. ... Fed officials are likely to dismiss the gasoline-driven jump in price pressures as temporary when they meet next week to evaluate the economy." "Consumer sentiment tumbled to its lowest since December 2011 in early March, hit by dissatisfaction with government economic policies and as fewer Americans expected to see improvements in growth or the labor market, a survey released on Friday showed. The Thomson Reuters/University of Michigan's preliminary reading on the overall index on consumer sentiment dropped to 71.8 from 77.6 in February, short of expectations for 78." The morning's other economic news includes word from the Federal Reserve, which says that "industrial production increased 0.7 percent in February after having been unchanged in January." Bloomberg News says "resilient consumer demand, increased capital spending and lean inventories are spurring the pace of work on assembly lines."